Father Ignazio Bonetti, CSS [1919- +1998] was an intelligent and wise priest who lived what he preached and taught. 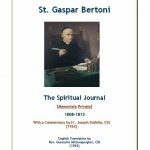 Just after his ordination, at only 33 years, he was elected superior of the Apostolic School in Verona, and became a point of reference for those interested in ecclesiastical culture. In 1965, together with some other clerics, he initiated the St. Zeno Theological Institute for the formation of diocesan and religious seminarians in the spirit of the Second Vatican Council. He became also one of those who favoured the opening of Theology to the laity, and was called in many parts of the diocese for conferences and debates. He loved intensely our Founder and the Congregation. 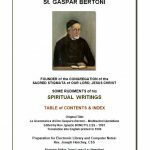 Besides his dissertation on the Five Wounds, for his degree in Theology, his work of art was the “Grammatica of Don Gaspare” – a collection of writings of the Stigmatine Founder.